I am pleased to announce the Editor’s Choice Article for Biotropica 49(1): Stephen P. Yanoviak, Cheryl Silveri, Alyssa Y. Stark, John T. Van Stan II and Delphis F. Levia Jr. (2017) Surface roughness affects the running speed of tropical canopy ants Biotropica 49(1): 92-100. Any tropical biologist that has hurried back to the field station for dinner after a long day of field work — in the rain, and uphill, obviously — will tell you that they were slowed down by the (slippery, muddy) substrate on which they were running. Now image you have six legs. And that if you fall of the trail you plunge to your death. That’s essentially what Steve and his collaborators were imagining when they dreamed up their really fascinating study. PS YOu can read more about Dr. Yanoviak’s research here. I highly recommend the videos of ants that fall off of tree canopies gliding back to the trunks. Really. Physical characteristics of habitats partly determine the ecology and behavior of their inhabitants. 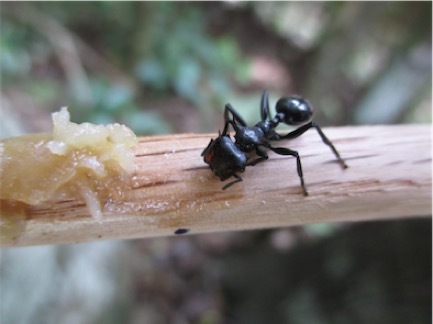 Unlike birds and bees, ants continuously interact with solid substrates when gathering food. Consequently, qualitative characteristics of physical substrates surrounding ant nests should affect their ability to forage efficiently. Also in contrast with birds and bees, time (rather than energy for flight) is the most important cost of foraging for ants. Every moment that an ant worker is outside the nest, its cumulative exposure to mortal hazards such as parasitoids, pathogens, or getting lost, increases. Lost ant workers are effectively dead, and are costly to colonies directly (as biomass that must be replaced) and indirectly (as reduced food income for the colony), thus selection should favor colonies with worker traits that maximize foraging efficiency and prevent loss. 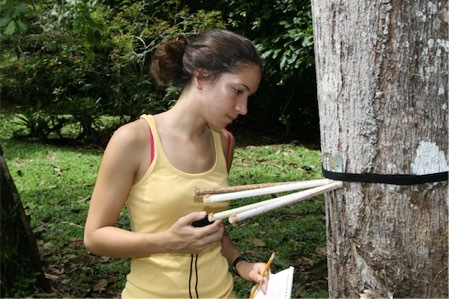 This paper is one of a handful of field-based studies we have conducted to explore the role of tree and liana substrate characteristics on foraging patterns of tropical arboreal and semi-arboreal ants. Our overarching question is “What factors determine how and where ants forage?” and our exploration of this topic builds upon related work by Michael Kaspari, Jennifer Fewell, Alejandro Farji-Brener, and many others. 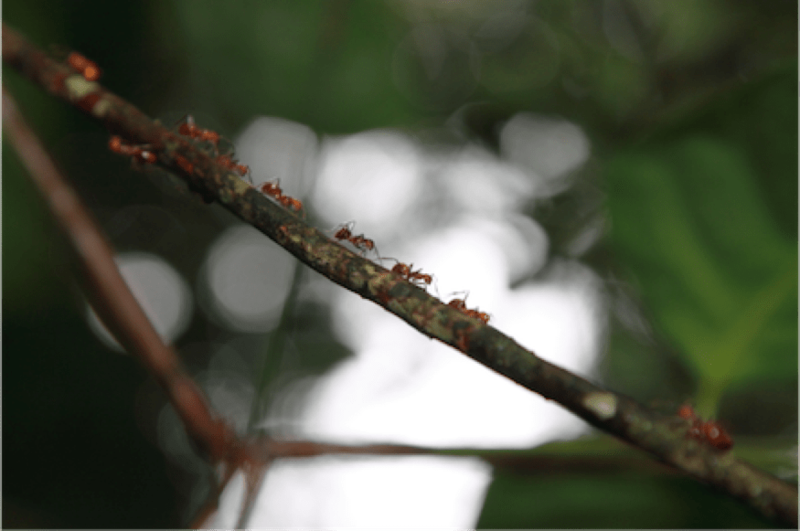 Our studies of plant substrate use by foraging ants grew out of many years of watching worker ants traversing stems and leaf litter in lowland forests of Costa Rica, Panama, and Peru. Ants are rather particular about where they establish foraging trails, and the bulk of arboreal species seem to preferentially use liana stems (when present) while avoiding tree surfaces, especially the trunk. 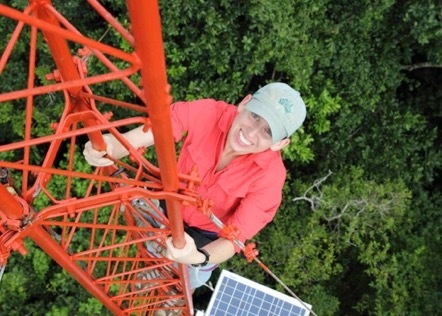 We started formalizing these observations into questions for NSF REU student projects at La Selva Biological Station in 2006-2008 in collaboration with Manuel Solis and others. Specifically, REU students Monica Bauer and Natalie Clay (currently an Assistant Professor at Louisiana Tech University) experimentally examined the use of liana vs. tree trunk substrates by various ant species (Clay et al. 2010). The results of that work led to the development of more refined questions by coauthor Cheryl Silveri concerning the role of stem size and surface roughness on ant foraging behavior (Yanoviak et al. 2012, and this Biotropica paper). Results from the superficially simple sandpaper-covered dowel experiment that Cheryl ran at La Selva (described in this paper) piqued our interest in understanding how ants perceive and respond to substrate roughness when foraging. In simple terms, we asked: What constitutes a bumpy road for an ant in nature? What magnitude of bumpiness makes the cost of travel prohibitive? And, how does that cost vary with body size? We quickly discovered that answering these questions unambiguously in terms of energetic cost and kinematic performance would be very difficult, if not impossible. Ultimately we focused on a single response variable—worker running speed—because it could be measured easily and relatively accurately in the field with a stopwatch, and is a reasonable proxy for foraging efficiency. A key technical challenge we faced was measuring roughness at the sub-millimeter scale without distorting the relevant surfaces. Historical approaches (e.g., Yarranton 1967) did not provide adequate resolution and were too cumbersome. Likewise, attempts to replicate stems with flexible resin and plaster casts introduced too much error. The ultimate solution was the LaserBark, an invention by coauthors Del Levia and John Van Stan (Van Stan et al. 2010) that proved to be almost tailor-made for the goals of this project. 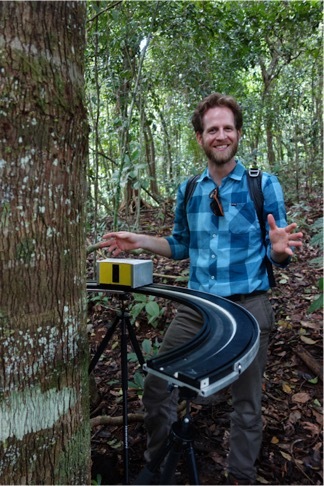 As shown in the Biotropica paper, this clever device drives a laser scanner around the circumference of a tree trunk or branch to provide very accurate profiles of surface microrelief. We decided to take this approach a step further by scanning the surfaces of relatively smooth liana stems with a laser confocal microscscope at the University of Delaware Bioimaging Center. Collectively, these laser scanning methods provided the most complete picture to date of the rugosity of plant surfaces experienced by foraging ants. Like many field-based studies of ecology and behavior, this project raised more questions than it answered. In particular, observations from the laboratory component of this project conducted by coauthor Alyssa Stark showed that chemical and physical properties of plant stems are important to ant locomotion by affecting the adhesive performance of tarsi. A preliminary assessment of ant adhesion in the lab showed that they can maintain tarsal contact with smooth substrates while (amazingly) resisting loads up to 3000x their body mass. Consequently, ant tarsal adhesion has rapidly developed into a major new direction for our research program and is being spearheaded by Alyssa. Another important question raised by this study (and arguably all research) is “What are we missing?” Field data and experiments are fraught with the problem of trying to explain the obvious while also not ignoring too many details that may be important. For logistical reasons, we measured speed as linear forward progress (i.e., ‘as the crow flies’) from point A to B. This approach ignored small vertical distances moved by the ant body over a given trunk or stem segment. In retrospect, it is likely that absolute speed, measured as the sum of distances moved in all axes per unit time, is relatively static for any given ant. Likewise, the consistency of ant running speed over substrate microrelief measuring less than 1/3 of ant body length suggests that the alternating tripod gait is very resilient to surface roughness that, at least in relative terms, would be a significant challenge to other (bipedal, or perhaps even quadripedal) organisms. Resolving these issues requires biomechanical data that, despite advances in image recording and analysis, remain difficult to collect in the field. Nonetheless, we see closer examination of ant kinematics and adhesion as two potentially very fruitful avenues for extensions of the results presented in this paper. Clay, N. A., M. Bauer, M. Solis, and S. P. Yanoviak. 2010. 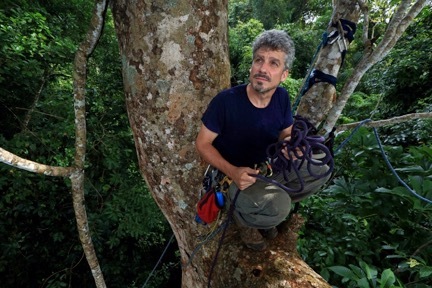 Arboreal substrates influence foraging in tropical ants. Ecological Entomology 35: 417-423. doi: 10.1111/j.1365-2311.2010.01197.x. Van Stan, J. T., II, M. T. Jarvis, and D. F. Levia. 2010. An automated instrument for the measurement of bark microrelief. IEEE Transactions on Instrumentation and Measurement 59: 491-493. doi: 10.1109/TIM.2009.2031338. Yanoviak, S. P., C. Silveri, C. A. Hamm, and M. Solis. 2012. 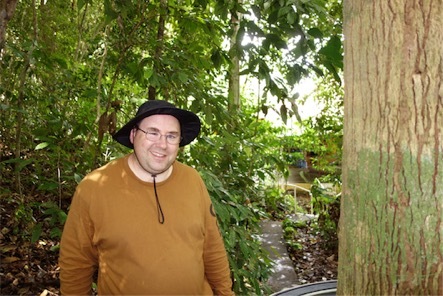 Stem characteristics and ant body size in a Costa Rican rain forest. Journal of Tropical Ecology 28: 199-204. doi: 10.1017/S026646741100071X. Yarranton, G. A. 1967. An instrument for measuring the microrelief of bark. Canadian Journal of Botany 45: 1173-1178.